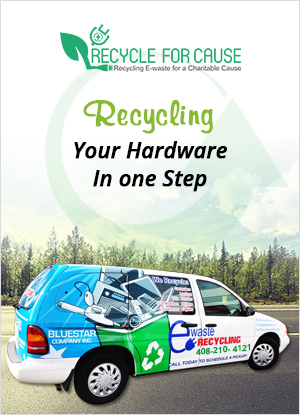 We are skilled experts in electronic waste products, recycling, reuse, and sustaining: hard disks, computers, laptops, mobile phones, batteries, printers, scanners, copy machines and servers. The reprocessing and recovering process ensures ecological preservation and sustainable development. Recycling can reduce and diminish the volume and intensity ofcast-off electronic waste items by eliminating structured materials from the printed circuit components. The reduction of hazardoussurplus helps facilities to meet the requirements of unused material that is exterminated under RCRA, 40 CFR 262 and Executive Order (EO) 13148, EO 13101, Greening the Government through Waste Deterrence, Recycling and Federal Achievement. Mountain View E-Waste is an expert player in data destruction and conforms to the US Department of Defense 522220.22-M. Being an active member of the National Association for Information Destruction, you are ensured full and safe data-destruction mode. The company provides various strata and procedures of data expiration, such as: harddrive chopping and grinding, harddrive destruction and harddrive overwriting and lapsing, etc. 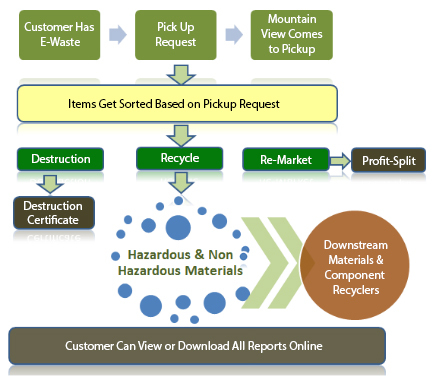 Mountain View E-Waste implements a best-in-industry harddrive demolition process that productively alters non-recyclable objects to innumerable tiny bits and fragments, ultimately resulting in safe dumping and disposal. When we achieve the data shredding procedure, materials have gone through material recovery and component recovery system blocks carried by downstream material recyclers & component recyclers respectively.